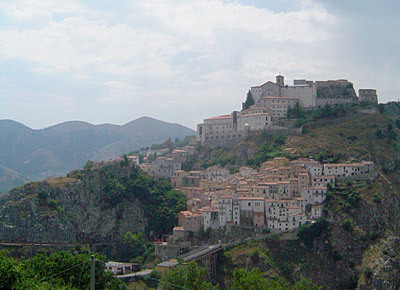 In the North Eastern part of Basilicata, a few kilometres from the border with Campania, is where the ancient centre of Muro Lucano can be found. It is dominated from the hill summit by its castle. Its foundation came about during the period of barbaric invasions (V century AD) by the hands of refugees from ancient Numistro, which was positioned in the Raia San Basile district. The Roman centre made headline news when in 219 BC it became the stage for a battle between Hannibal, the Carthaginian General and Consul Claudio Marcello. Today, not much remains of Numistro, also known as Muro Romana except the megalithic walls, traces of habitation, the remains of a Roman temple and the ruins of the Basilian monastery from the Medieval era. The Medieval Murum was a fortified Longobard centre where the first tower was erected (VIII century). Basilian monks from the East arrived during this period. During the XI century it passed hands to the Normans who amplified the Castle. Muro Lucano was involved in the Ghibelline Revolts (1268) against the Angioiniansans, who subsequently made it a fief of the Sanseverino family and gave the Castle its present day appearance. Muro Lucano was a fief of the following families: Durazzeschi, Ferino and Orsilli of Gravina. During the ‘700s it enjoyed a period of economic development through the birth of textile and fulling-mill industries, and at the end of the century actively participated in the Republican Motions (1799) which were linked to the Republic of Naples. Muro Locano has often been damaged through history by earthquakes (1694, 1857, 1930) and still has an open wound from seismic activity during 1980. The primary architectonic structure in Muro Lucano is its Castle which was founded during the VIII century and then re-constructed during the Angioiniansan era (XIV century). Today it preserves very little of its Medieval structure due to reconstruction following the 1980 earthquake. Among the religious buildings, we would like to cite the Cathedral, which already existed during the X century but has been heavily re-adjusted, and the San Marco and Sant’Antonio Churches. One can also visit the National Archaeological Museum in Muro which exhibits Lucani finds from the Bronze and Iron Ages. There are many excursions and possible visits, among which that to the ruins of Numistro, the Roman bridge on Rescio and the Chiesetta (small church) of Capodigiano (XIII Century). The Castle (XIV century); San Nicola Cathedral (X century); Monument to Fallen Soldiers of Saverio Gatto; San Marco Church; S. Antonio Church; Carmine Church (1606); Numistro or “Muro Romana”; Roman Bridge on the Restio River; Vucculi Grottoes; Chiesetta (small Church) in Capodigiano; Cappuccini Church and Convent (XVI century). The birth of San Gerardo Majella on 6th April; Feast of the Madonna of Fatima on 13th May; Feast of Sant’Antonio on 13th June; Feast of San Vitor on 15th June; Feast of the Madonna delle Grazie on 2 July; Feast of San Gerardo Majella on 2nd September; Feast of San Gerardo on 16 October.